she did. 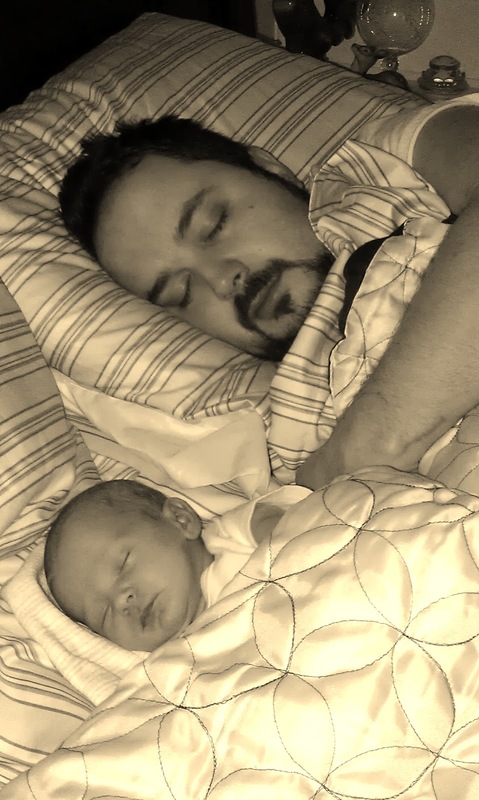 Co-sleeping really wasn't one of those parenting decisions my husband and I had discussed and considered prior to the birth of our daughter. We had bought a bassinet and had lovingly set it up in our bedroom. There was never any question that she would be in our room with us. But in the bed with us? The thought hadn't even crossed our minds then. When our sweet baby girl was born, we struggled with establishing breastfeeding those first few days in the hospital. And I was actually kind of surprised by it. We had done everything that my breastfeeding books had told us were crucial to breastfeeding success- she was immediately placed on my chest right after birth; she nursed within the first 30 minutes. And our progress with nursing went steadily downhill from there. I knew the importance of skin-to-skin contact in assisting with breastfeeding, and fortunately my nurses did too. Even though there was a sign in every room on the Labor & Delivery floor that explicitly stated that babies were never permitted to sleep with their mothers in the hospital beds, my nurses encouraged it in our case. She needed the skin-to-skin cuddles and warmth. Many of our nursing sessions those first two days were spent with her crying and fussing, and me exasperated, stressed, and sobbing. But the hospital co-sleeping was helping. It was getting easier. And then we came home. Carina is not the easy-going, self-soothing baby my son was. She is her own person, with her own temperament. And she often requires lots of snuggles, babywearing, and closeness. She may be what some would deem a high needs baby. I knew that just lying her down in a bassinet at night was not going to work with her. And honestly when I really thought about it, it made sense. She had been sleeping as close to me as any person other than my son had for the past 9 months. And now she was expected to just sleep by herself isolated without the warmth of her mother for the night? It did seem somewhat unreasonable, even slightly cruel to me. So, she slept with us that first night she came home with us from the hospital and she has every night since. At first, I was leery to tell anyone that we were co-sleeping. Even to our pediatrician. I knew bedsharing has had a very bad rap lately. But I started to share more and more with friends about our choice to co-sleep and started finding that many of my friends who are parents, albeit in hushed tones, admitted to co-sleeping with their kids. I have received a few reactions of "aren't you afraid of rolling over on her?" or "are you afraid of suffocating her?". And quite frankly, no I am not. The Baby Sleep Book is a great resource for any parents considering co-sleeping. I ordered this book as soon as it was apparent that we would be co-sleeping with our daughter. The book contains strong research for the benefits of bed sharing, and tips to make sure you are co-sleeping safely. The Baby Delight Snuggle Nest is great for parents who may be a little anxious or hesitant at first about co-sleeping.